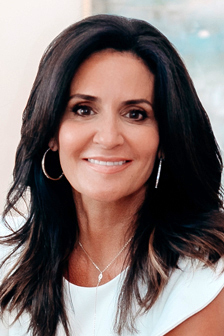 Tina Ciaccio (pronounced "Cha-Cho") is a Christie's International Real Estate Specialist for Michael Saunders & Company, specializing in the area's finest properties and luxury homes for Lakewood Ranch, Sarasota and Bradenton, including the area's barrier islands of Siesta Key, Lido Key, Longboat Key and Casey Key. Tina is originally from the Washington Metropolitan area, and grew up working for her f... more.amily's restaurant business from a very young age. Fluent in Greek, Tina graduated with a Bachelor of Arts in International Studies from George Mason University, and went on to work as a paralegal in Washington, DC, for Andrews & Kurth, LLP beginning in 1994. She later began her real estate career in 2002 while still living in Northern Virginia, when she won the NVAR Million Dollar Sales Award during her first rookie year in real estate. Tina relocated to Florida with her family, where she has successfully continued her real estate career and residency in Lakewood Ranch since 2004. As a Certified Luxury Home Marketing Specialist, Tina was inducted into the Million Dollar Guild in 2013. Tina marketed and sold the #1 Top Sale for Lakewood Ranch in 2014. In 2015, she marketed and sold 3 of East County's Top 10 sales transactions. Tina has been recognized by her clients and peers for Best in Client Satisfaction by Sarasota Magazine for 2014 and 2015. In 2016, Tina earned the designation as a Christie's International Real Estate Specialist. As a consummate professional, Tina's exemplary performance has earned her clients' trust, countless testimonials and repeat business due to her local knowledge, global connections, integrity and discretion. Her strength lies in the ability to quickly grasp a client's real estate goals, while accommodating even the most discerning need for discretion. She has the tact to collaborate with all players in a transaction, so clients reach their desired end result via sound market advice and best-in-class service. Expertise. Integrity. Discretion. Trust. ...less.